Women have many weapons in their battle for healthy moisturized skin. Facial creams- morning, day time, nigh time creams, body creams- butters, milk, scrubs, hand creams- hydrating, non greasy, greasy… And we thank them for it! But that’s not something that works for us men. We need something simple yet complex. One weapon with which we can win every battle! Something carefully formulated, high quality and made with so much care that all your body can benefit! Knowing all of this, we decided to give you exactly that. 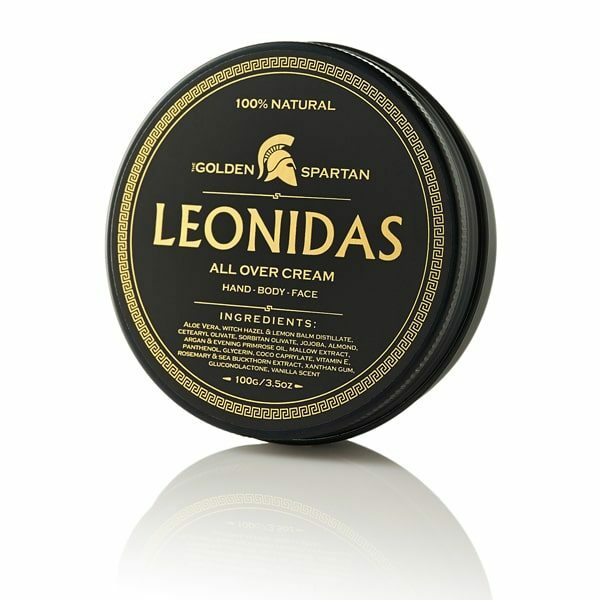 We present you with our new face, body and hand cream, our LEONIDAS All Over Cream. Made from 100% natural ingredients; without water, cheap fillers, parabens, sulphates and other very harmful substances. Handcrafted with high quality natural oils, hydrosols and extracts, rich in vitamins and minerals. Ingredients: Aloe Vera, witch hazel distillate, lemon balm distillate, cetearyl olivate, sorbitan olivate, jojoba oil, almond oil, argan oil, evening primrose oil, mallow extract, panthenol, glycerin, coco caprylate, vitamin E, rosemary extract, sea buckthorn extract, xanthan gum, gluconolactone, vanilla scent.